I am going to try to update my page daily, but I may miss a day here and there. I want to share some vital facts about cats and the feral cat population. I will share my source each day. Please be sure to read below the fact of the day as well! Day 1: Misinformation costs millions of cats their lives every year. As the only national advocacy organization dedicated to the protection and humane treatment of cats, Alley Cat Allies is working to set the record straight. By educating people on the truth about community cats (also known as feral cats) and combatting the false claims, we can stop the killing. The facts below call for a world where every cat is valued and protected. A world in which every cat – regardless of whether it lives with people or not – is safe to live its life without threat from humans. FACT: Cats live outdoors—always have, always will.Millions of cats share our homes, but not all cats are suited to living inside. For many community cats (also known as feral cats), indoor homes are not an option because they have not been socialized to live with humans. They would be scared and unhappy indoors. Their home is the outdoors—just like squirrels, chipmunks, and birds. They are well suited to their outdoor home. Day 2: FACT: The real threats to wildlife don’t meow. A small group of conservationists claims that cats are such an enormous threat to wildlife that they should be rounded up and killed. Shooting, poisoning, and mass extermination are among the extreme methods they suggest as solutions. Several prominent ecologists point to the fact that cats play an important role in many ecosystems, often stepping in to fill the place of now extinct or greatly diminished small predators. Some point to the helpful roles they play in complex urban ecosystems, in which dumpsters, rats, and mice far outnumber meadows. As for the main threats to wildlife, leading biologists and environmental watchdogs agree: human-led activities—including climate change, habitat destruction, and development—are far and away the number one cause of wildlife depletion. Find out more about cats and wildlife. By now, most people know just how much saving the lives of animals means to me - especially the feral kitties like my current foster babies! It is my dream to someday own a cat sanctuary where no cat or kitten - regardless of health status or age - is ever turned away. It would be a true kitty heaven with every amenity a kitty could ever want or need. Until then, I will foster babies and make sure they are spayed and neutered, then find them a furrever family to love them till they cross the Rainbow Bridge. Many of you know that I suffer from CRPS, a very painful disease that has no cure and makes my body feel like it is on fire. One location of it is in my left knee. Walking is painful due to CRPS as well as osteoarthritis. I use a cane to get around and only walk very short distances. Most of the time, I use an electric cart to shop and Logan pushes me in a wheelchair if we go to any events. 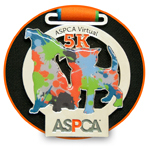 This June, Bella and I will be participating in the inaugural ASPCA Virtual 5K! I am excited to be participating and honored to be raising the awareness and the much-needed funding to support the ASPCA's programs. Your donation will help the ASPCA provide life-saving programs and services to millions of animals nationwide. The ASPCA is very important to me and I appreciate your help as we fight to give abused and homeless animals a second chance at life. Please support me by making a donation and help me make a positive impact in the lives of animals! Thank you!